Russia (MNN) — The political winds continue to change in Russia. Many Christians in that country are concerned about the loss of religious freedom under President Vladimir Putin. While it's a far cry from Joseph Stalin, Putin appears to be turning back the clock as it relates to free speech and religious freedom. Joel Griffith with Slavic Gospel Association says there are questions. "What direction is Putin going? Well, you can't really say he's a communist. He isn't, but he's not really what you would call a western democrat, either." Since President Vladimir Putin came into power in 2000, he has "launched a comprehensive program to ideologically reeducate society," Lev Gudkov, director of independent Levada Center polling group, told Reuters. "Putin's spin doctors did not deny that Stalin's regime had conducted mass arrests and executions but tried to minimize these events…while emphasizing as far as possible the merits of Stalin as military commander and statesman who had modernized the country and turned it into one of the worlds two superpowers," Gudkov wrote. a position of military might, but the human cost was really high,"
"Joseph Stalin has a very bloody legacy," Griffith continues. "Even compared to the other communist and dictators that followed him, Stalin was–among all of them–the bloodiest. Millions of people died at his orders or as a result of his orders. "From a Christian perspective, you look back on it and see how Stalin persecuted the church. There was a brief period of thaw during WWII, when the believers were needed for support, so he stopped the persecution of churches for a while. Then after the war was over, it was resumed with a renewed vigor. So Stalin, from the perspective of believers, has an awful bloody legacy." 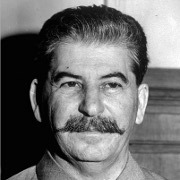 In a 1994 poll, two-thirds of Russians agreed with the statement that "Stalin was a cruel, inhuman tyrant, responsible for the deaths of millions of innocent people." But for the last 13 years of his power, Putin has put a different light on Stalin. In a 2013 poll, asking the same questions asked in 1994, 47% of respondents said Stalin was "a wise leader who brought the Soviet Union to might and prosperity." Only 32% of those who responded said it was negative. This is roughly the opposite of the 1994 survey. Many older Christians remember the days when fellow believers would disappear in the night, never to be seen again. But the younger generation has only stories to rely on when it comes to Stalin, says Griffith. "The generation that's growing up now has no memory of that communist past, and that certainly is a concern. We've really got to pray for the next generation as well, that they are able to have a really firm, truthful historical grasp." Pray that believers will continue to share the good news of Christ in Russia. "I don't think we can ever let our guard down as prayer warriors for believers over there," urges Griffith. "They are going to continue advancing the Gospel, no matter what."